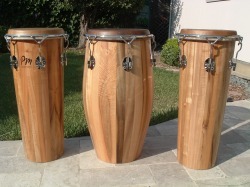 These custom-made drums are some of the last hand-made congas manufactured totally within the United States. Most factory-produced drums, including many of the name brands you are most familiar with, are now made overseas. 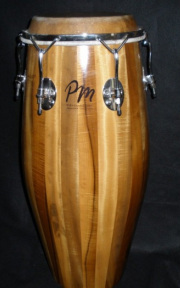 PMPercussion congas and drums are made of the finest California and Oregon pepperwood, sustainably harvested and milled in small batches. 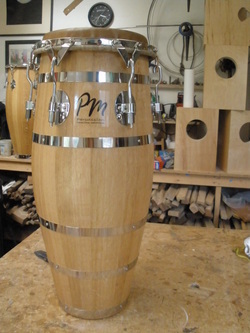 Each unit of wood has its own distinct look, and Peter meticuluously matches the grain and patterns to produce the finest looking and sounding drums available today. Not only are these drums elegant, graceful and strong, but they produce the crispest, cleanest sounds and greatest playability you'll ever find. Peter chose this wood for the strength, the look, the weight, but mostly, for the rich, warm tones. There are none better! Each set is uniquely matched. From each side it's a different drum - each angle looks different - unique. 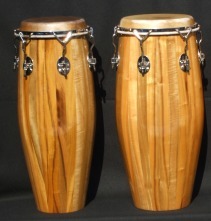 These are the same drums, different sides. 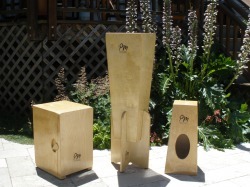 Here are the different standard sizes that can be purchased, each with its own unique sound. 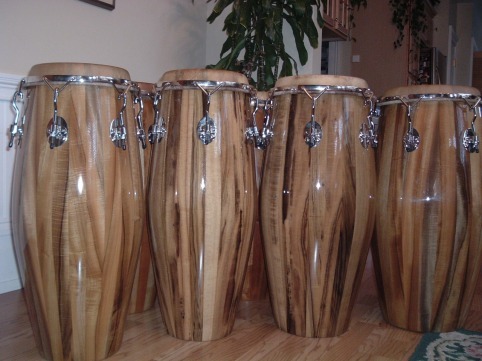 Standard sizes are available while super-tumba and requinto are special order. Contact Peter directly for pricing and ordering: call 707 / 762-9012 or use this website and convenient contact form. 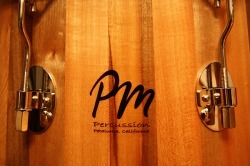 PMPercussion drums are sold at music stores such as: Drummers' Tradition, San Rafael, CA; Sonoma Valley Music, Sonoma, CA; Tall Toad Music, Petauma, CA; and Loud and Clear, Cotati, CA. Hammered and Gold Plated Custom-made by request. 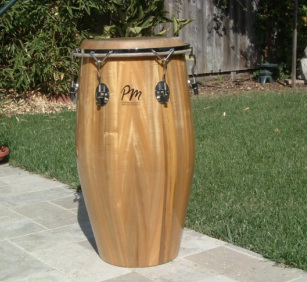 This one was a special request for hammered, 23K Gold plated hardware finish on a darkly striped bay wood quinto. 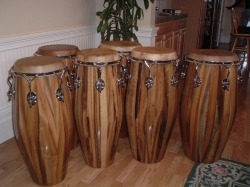 Inventory includes congas, tumbas, super tumbas, ashikos, and many styles of cajons, including bata cajons. They are sold individually or in custom sets. The ashiko can be ordered with brackets for waist and shoulder straps to ease carrying for carnival. 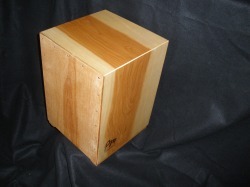 The short drum was made special request as a birthday present and is not in production at this time. Buy singly, by the pair, triplets, or in four. Wood for each set is matched to perfection. All sets are like-numbered, signed, and dated. 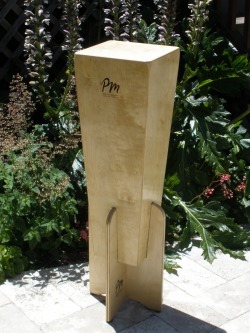 At 30 inches high, this taller cajon is becoming very poplar. 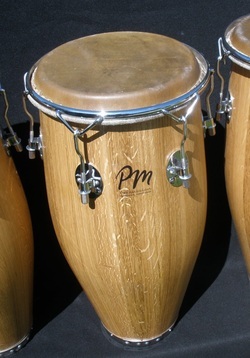 Rather than sit on it, the player tilts it to the side like one would a conga, or stands can be custom-made to fit the player's preference. These can also be made with adjustable snares for a different sound effect. 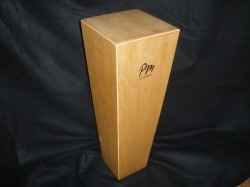 At 19 inches tall, this all-wood cajon can double as a drum throne as well as a multi-tonal percussion instrument on its own. 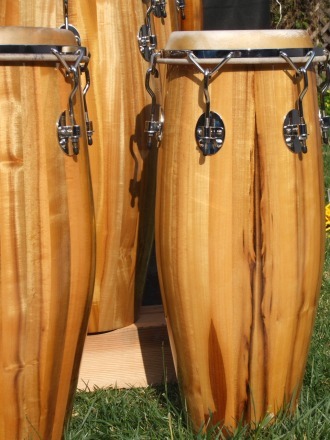 These drums can be ordered with or without snares. All shell joints are lock-mitered for additional strength and longevity. 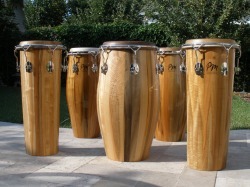 Known for its projection, resonance, and recording qualities, more professionals are requesting the larger Tumba. The playing surface of my super tumba is 14 1/2 inches. 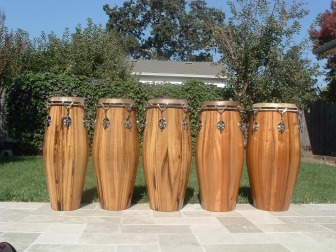 This is a newer set made from recycled genuine oak wine barrels that once aged Napa Valley wines. 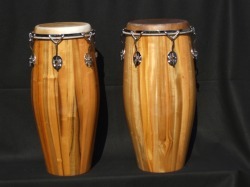 These hand-made drums produce a rich, warm, organic sound, not found in most contemporary drums. Because these are made of genuine wine barrels they show some distinctive markings of their former lives. 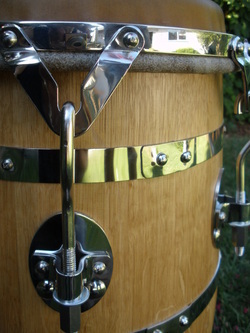 You may find small tack holes or staple scars in some of the drums, adding character, but not affecting the sound. 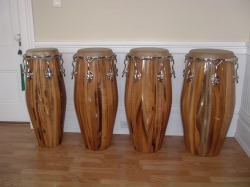 These oak drums were once wine barrels, re-purposed in the fashion of the original Cuban master-drum makers. The staves have been reshaped, slotted for joinery biscuits and assembled with marine epoxy to produce the strongest shells possible. 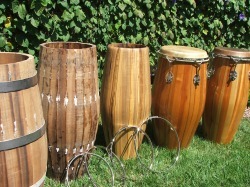 They are fitted with hoops in the Cuban tradition. While the hoops are substantial, they are primarily cosmetic. Inside the drums are an alma ring to reinforce the bearing edge and a device engineered to eliminate any overtones. 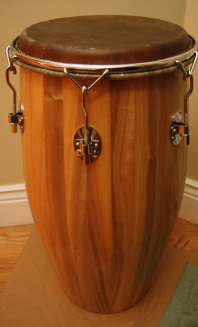 What you are left with are the crisp, clean sounds expected from my drums, coming from the beautiful traditional look of the early Cuban drums.